This DSTAR project develops guidelines for avoiding nuisance operation of feeder capacitor bank fuses due to switching transient and lightning duty. Fuses protecting capacitors on distribution feeders are subjected to high currents from transient phenomena such as lightning and switching surges. It is possible for the transient currents to operate or damage the fuses, even though the protected capacitors remain undamaged, thus yielding a nuisance fuse operation. 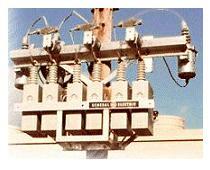 Some utilities report unexplained operations of cutout type fuses protecting feeder capacitors. Such nuisance fuse operations increase utility operating costs and also may subject customers to reduced voltage or three-phase voltage imbalance if only one or two phases have blown fuses in a three-phase capacitor bank. DSTAR addressed this issue in response to membership’s need for improved guidelines regarding minimum fuse size needed to avoid nuisance operation due to routine system voltage transients. The analysis strategy undertaken in this project was to assess the fuse duty under a variety of abnormal system conditions. These conditions include lightning and switching transients, and harmonic current injections. In addition to performing analytical calculations and simulations using EMTP, fuses collected from the field were torn apart to identify the most likely mode of failure. The 83-page final report is organized as shown on the left.